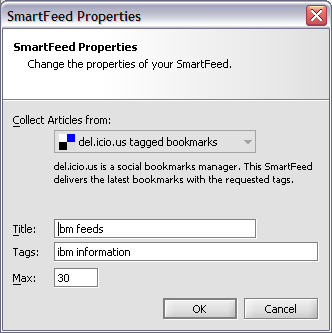 The screenshot below shows a list of delicious tags (semantic_web, rdf, semantic-web etc) that are subscribed using Smartfeeds and then aggregated using a single feed (the first one in the Feeds pane). 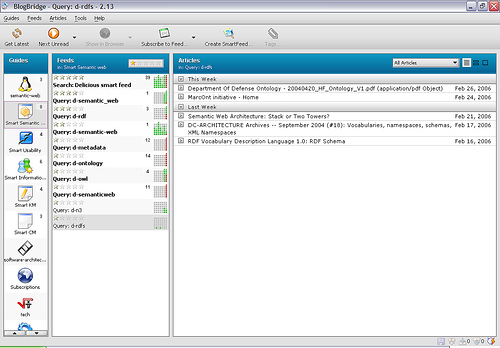 The screenshots below show how a Smartfeed looks and how it displays the articles for the feed. 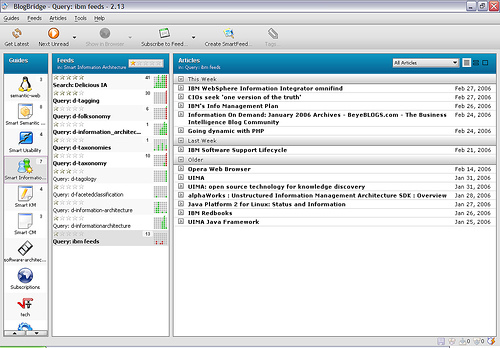 It also has the features of synchronization, feed discovery, keyword based filtering, a cleanup wizard etc. Switching to a new reader has some problems. While moving your feeds to a new reader takes minutes with the OPML import/export that they support, the problems are more to do with the usability aspects. For example, the first thing I missed was the VIM navigation keys in Google. It was so easy to switch between articles and star them. Before I switched to Blogbridge, this was my major looking-forward-to-seeing-this feature in any reader – Keyboard navigation. Blogbridge has keyboard navigation but it lacks the ease of use of Google (atleast this is my personal take on this). Also there is no starring at the article level. But otherwise, this is something that is strongly recommended if, as Blogbridge puts it, you are a real info-junkie.